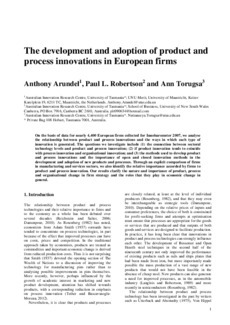 On the basis of data for nearly 4,400 European firms collected for Innobarometer 2007, we analyse the relationship between product and process innovations and the ways in which each type of innovation is generated. The questions we investigate include (1) the connection between sectoral technology levels and product and process innovation; (2) if product innovation tends to coincide with process innovation and organisational innovation; and (3) the methods used to develop product and process innovations and the importance of open and closed innovation methods in the development and adoption of new products and processes. Through an explicit comparison of firms in manufacturing and services sectors, we also identify the relative importance accorded by firms to product and process innovation. Our results clarify the nature and importance of product, process and organisational change in firm strategy and the roles that they play in economic change in general.